Denver - A creamy white bloom with many petals. It is a very prolific bloomer. One of the best blooming new varieties out. Arc-en-ciel- a pink bloom with magnificent foliage. The Leaves are colored pink, red, green, gold and various mixes. Walter Pagels- Small bone white blooms with true green leaves. Pink Beauty- The medium pink flowers are darker in the center and become lighter on the edges of the petals. Hermine- Medium, pure white bloom with bright green leaves. Pink Sensation- Medium light pink blossoms. Late to blossom, but great all summer! Mayla- It has beautiful, large, hot fuschia pink blooms with dark green leaves. Charlene Strawn- The lemon yellow blooms are held above the water surface. The flower is slightly fragrant. Rembrant- Wine red bloom. Leaves are maroon to dark green. This is a medium size water lily. Texas Dawn- A vigorous grower that boasts blooms in profusion. Charlies Choice-This water lily is a small and for perfect for a small garden. The blooms are a soft red. Helvola- A true pygmy water lily. The small yellow blooms are approximately 2 inches in diameter. The leaves are mottled with maroon. Perry's Baby Red- A small lily with dark red blooms. This is one of the longest blooming water lilies. Joey Tomocik- The richest yellow hardy water lily, holds flowers high above the water like a tropical water lily. Gloriosa- Small red, gorgeous blooms. Okechobee Yellow- Very large lily! Light yellow bloom, huge lightly mottled leaf. Great cover plant. Laydekeri Fulgens- A must for red lily lovers! Vibrant red blooms with delicate green leaves. Small. Sultan- Beautiful red bloom. 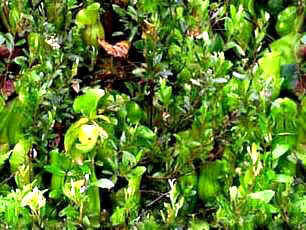 Bright green leaves. Barbara Dobbins- A very large bloom which flowers freely. The petals are a salmon to dark peach color. Sioux- Beautiful creamy peach bloom, great summer bloomer. Indiana- A small lily which changes dramatically over a three day period from pink, orange, to red. Excellent for tub or container gardens. Colorado- This is a larger water lily, best for medium to large ponds. The blooms are a salmon color and constantly produce blooms. Baby Doll- A very small white lotus, perfect for small gardens. It blooms better than most varieties. Baimudan- A very double white bloom, a very good bloomer. Momo Botan- This small variety of lotus has red flowers resembling a peony. It does well in a small garden or tub. Blue Girl- A white bloom with pink tips and veins. Double Rose- A large lotus with a beautiful pink flower that has a double bloom. Grand Slam- A red very double bloom on this beautiful lotus. Little Drunken Fairy- A single petaled pink flower, very delicate and beautiful. Red Bowl Lotus- A red double blooming lotus that fades to white. Pink Bowl Lotus- A pink double petaled bloom. It is a profuse bloomer. Small Jade Mansion- This lotus is a white double flowering dwarf lotus. Sparks- A very good red blooming lotus. Yangzhah Bowl- A small pink bloom with red veins and tips. Young Chow Lotus- A single petal red bloom that is magnificent.